A few years ago, when professional athletes started to drink coconut water for hydration, endurance and all round good health, I decided to try it. Using coconut milk is a great way to add a creamy delicious flavour to curries and soups. I use Biona Organic coconut milk which you can buy in supermarkets, health food shops, or online from www.nourish.ie. Most other brands contain E-numbers and additives. I use coconut cream when making certain types of curries. You can buy it in any supermarket. It comes in a pack in a solid block, but when added to the sauce it melts in as it heats. Coconut flour is a soft flour made from dried, ground, coconut meat. It can offer a gluten-free and protein-rich alternative to traditional grain-based flours. After it’s been ground to a soft, fine powder it’s then suitable for baking. It’s rich in protein, fiber and fat which makes it exceptionally filling. It’s also a good source of lauric acid, a saturated fat thought to support the immune system and the thyroid. Like most healthy fats, lauric acid also promotes good skin health. Coconut flour is an exceptionally good source of manganese which helps you to better utilize many nutrients including choline and biotin (found in eggs), vitamin C and thiamin. Manganese also supports bone health, nervous system function, thyroid health and helps to maintain optimal blood sugar levels. I grate and freeze coconut meat to add to soups, curries, and when baking. You can read about how to open a coconut and prepare the meat for grating, from my last post, here. I use coconut oil for cooking, and as a beauty product. Over the last two weeks I’ve also used it for oil pulling - an ancient dental and cleansing technique that involves swishing a tablespoon of coconut oil around your mouth on an empty stomach for around 20 minutes. 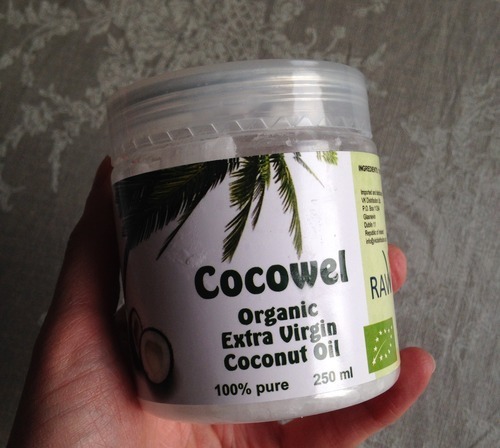 I use Cocowel organic extra virgin coconut oil which is sold in the same section as other cooking oils in the supermarket, and has a white, thick, texture, similar to lard. Coconut oil is now known to be one of the healthiest oils you can use when cooking. You can use it to replace any cooking oil, however, it’s not tasteless like some other cooking oils. It can help you to burn more fat. The lauric acid that coconuts contain can kill bacteria, viruses and fungi. It’s one of the richest sources of saturated fat - New data is showing that saturated fat is harmless (I know, I know, next year it probably will be!!). But coconut oil doesn’t contain your average run-of-the-mill saturated fats that you would find in cheese or steak. They contain Medium Chain Triglycerides (MCTs), these are metabolised differently. Which means they go straight to the liver from the digestive tract, where they are used as a quick source energy. 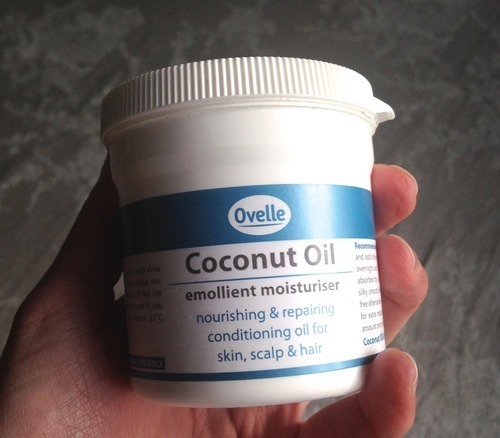 I use Ovelle coconut oil which you can buy in pharmacies. I must admit it did take me a little while to try coconut oil as a moisturiser. It felt a little strange rubbing the same thing on my face that I use to fry an egg! However, I eventually decided to give it a go and I haven’t looked back. It took me a few goes to figure out the best way to use coconut oil on my skin. Coconut oil, well, it is what it is. There isn’t one type for for oily skin or one type for dry skin so by trial and error I just figured out the best moisturising routine for me. Using it every day was a little too oily so I switched to slathering it on 2 - 3 times a week before bed and I’m already seeing a big difference. I’ve heard Gwyneth Paltrow uses it and whether you’re a fan or not, you’d have to agree, she does have an amazing complexion! I’ve also used coconut oil as a moisturiser on my youngest son from the time he was baby. It’s great for cradle cap and dry skin, and because it’s all natural it’s safe to use from birth. Oil pulling involves swishing a tablespoon of coconut oil around your mouth on an empty stomach for 20 minutes. It draws out toxins in your body, and improves dental health. For the last two weeks I’ve been doing coconut oil pulling. Here’s how I got on! I start by placing a tablespoon of coconut oil in my mouth first thing in the morning, and letting it melt. The first day it was a whole new experience for me and not pleasant at all! The coconut oil was cold, and hard, and oily, and a tablespoon is actually a lot. It also takes a couple of minutes to melt down. Once it turned to liquid I didn’t mind it at all. It’s just like swirling a tasteless mouth wash around your mouth, and for some reason it doesn’t even feel oily once it’s turned to a liquid. Also, the coconut oil doesn’t taste of anything when you’re swishing it around, but strangely as soon as you get rid of it you’re left with a suncreamy coconut taste for a couple of minutes! After you get rid of the oil (always in the bin as it will clog the sink!) rinse out your mouth, and then brush your teeth. This is a proven inexpensive natural way of whitening teeth and improving oral health. The timing is supposed to be key, no more that 20 minutes, no less. It’s long enough to break through plaque but not long enough that the body starts re-absorbing toxins and bacteria. Oil pulling can also improve the condition of skin by drawing out toxins, it can help with arthritis, asthma, headaches, hormone imbalances, infections, liver problems and more. Well, I suppose I’ll stick with it then! Here’s what I found out while exploring the web. Preshave – coconut oil will prep skin for the pending damage caused by shaving. Aftershave – coconut oil will help heal your skin after shaving without clogging pores. Deodorant – coconut oil alone can be used as a deodorant, but is even more effective in combination with cornflour and baking soda. Hair conditioner/deep treatment - use as a leave in hair conditioner by applying a teaspoon of coconut oil to your ends and then running your fingers through your hair to distribute the rest. For a deeper treatment, rub in a tablespoon of coconut oil onto your dry scalp and gently work through to the ends. Put a shower cap on to prevent transfer onto pillow cases and bed clothes and leave on overnight. Hair gel/serum – rub a little between your palms and either scrunch into hair (for curly hair) or finger comb in through from scalp to ends (for wavy/straight hair). Toothpaste – mix coconut oil and baking soda and dab a little of the mix on your toothbrush. Make up remover – use a cotton pad and a dab of coconut oil. Apparently it’s amazing at how well this works. Chapstick – just rub a little into lips and it not only acts as a softening agent but it also has an SPF of about 4 so you get a little protection too. Stress relief - relieve mental fatigue by applying coconut oil to the head in a circular, massaging motion.The natural aroma of coconuts is extremely soothing thus helping to lower your stress level. Digestion - the saturated fats in coconut oil have anti-bacterial properties that help control, parasites, and fungi that cause indigestion and other digestion related problems such asirritable bowel syndrome. The fat in coconut oil also aids in the absorption ofvitamins, minerals and amino acids, making you healthier all around. For breastfeeding moms - consuming 3 ½ tablespoons of coconut oil daily will enrich your milk supply. Fitness - coconut oil hasbeen proven to stimulate your metabolism, improve thyroid function, andescalate energy levels, all of which help decrease your unwanted fat, whileincreasing muscle. Replacement forbutter or lard in its solid form – greasing pans, pastry crusts, spreading on bread etc. Replacement for variousoils in liquid form – baking, cooking, sautéing, etc. coconut oil with peppermint oil extract and rub it all over exposed skin. as well as hasten the healing process. process of bruises by repairing damaged tissues. soft. You can also add in essential oils like lavender. Nutritional supplement - melt and add to smoothies. So, it seems you can do just about anything with the humble coconut! Coconut oil contains 87% saturated fat, which means that while its main saturated fat —lauric acid—does raise beneficial HDL cholesterol, it can also raise harmful LDL cholesterol, which is known to increase the risk of heart disease. Having said that, it is one of the healthiest oils you can use in cooking. 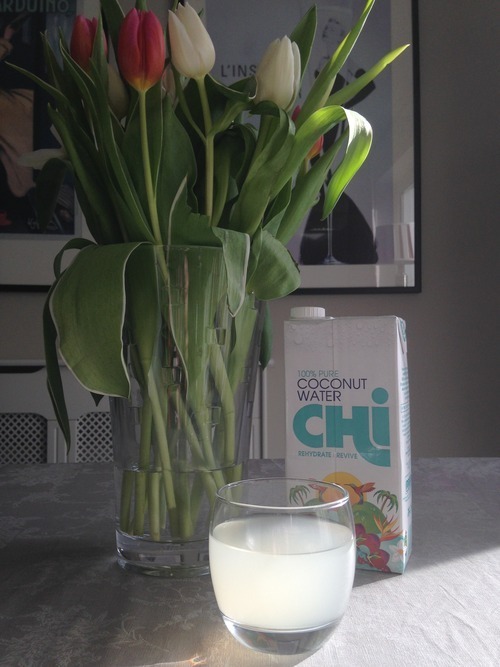 Coconut milk contains 445 calories and 48 grams of fat (43 grams saturated) per cup! However, you can substitute ‘light’ coconut milk for traditional coconut milk to trim roughly two-thirds the fat and calories. I never use 'low fat’ anything, so the coconut milk I used in the Thai red curry recipe is full fat. However, adding 'light’ coconut milk in this recipe won’t change the flavour. Well, there you have it, there really is A LOT to say about coconuts! Only once I saw "cocowel" being sold here in California. I love this brand and has een looking for it. Could you let me know where I an purchase COCOWEL brand? Please... I'm desperate. Thank you.